Ezra Hall isn’t a land-use expert. But after receiving a packet in the mail from AT&T several weeks ago, the Richmond resident may be on his way to becoming one. The telecommunications giant was letting Hall know that it had signed a contract with his neighbor to build a 140-foot-tall cell tower on her Cochran Road property. As an adjoining landowner, Hall has 45 days to file any input about AT&T’s project with the state. Hall has his worries, including the possibility of lower property values and health issues arising from nearby telecom equipment. Of greater concern to the electrical engineer, though, is the way a corporation as large as AT&T was able to bypass the town’s zoning regulations and design codes. To be approved by Richmond’s development review board, telecom equipment is supposed to have a “stealth design” that blends in with the surrounding buildings or landscape, according to the town code. AT&T has already constructed a stealth antenna in Richmond, on the Verburg Farm silo near I-89. But according to Hall, the only thing stealthy about AT&T’s more recent proposal is the way it was allowed to skirt town planners. “You buy into a town based on the value of the school, the neighborhood you’re going into, what it looks like, who your neighbors are, what’s next door to you. Because you’re expected as a homeowner to comply with the zoning regulations, you have an expectation that others will, as well,” says Hall. In this case, though, Hall says he and other residents are victims of a bait and switch. As part of the effort to blanket Vermont with broadband internet service, the state has allowed AT&T and other telecoms to bypass town boards and win their approval directly from the Vermont Public Service Board (PSB). Hall has a higher stake in the issue than most. To live on Greystone Drive, residents must pay a property tax premium — commonly known as the “view tax” — because the road snakes up a ridge and offers vistas of the valley below. The Cochran Road cell tower may have company in those vistas. AT&T has plans for two others in the Snipe Ireland Road and Williams Hill areas. Meanwhile, SBA Communications, a Florida-based wireless equipment provider, has also proposed a 140-foot-tower on Johnnie Brook Road. Vermont Telephone Company (VTel) plans to rent space on that structure for a wireless broadband antenna. For that project, SBA and VTel also went straight to the state. 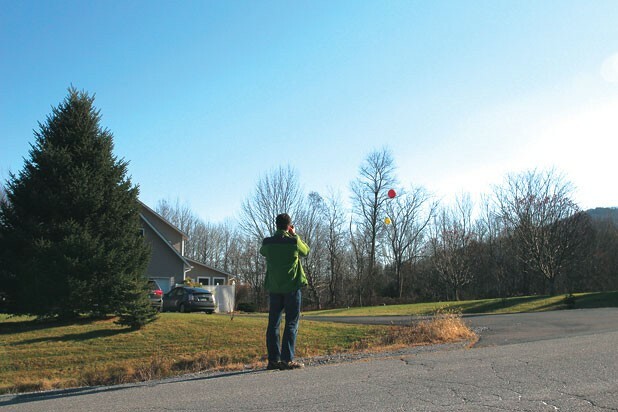 It’s no accident that telecom companies have been able to skip the town’s zoning process. The permission they need to break ground on the projects, called a certificate of public good, is issued by the PSB, a quasi-judicial entity whose three members are appointed by the governor to supervise Vermont’s public utility services. As former governor Jim Douglas and Gov. Peter Shumlin have pushed to expand high-speed broadband access across the state, a linchpin of their efforts has been Vermont Statute 248(a), which allows telecom companies to circumvent municipalities by applying directly to the PSB for their certificates. In 2012, the Shumlin administration announced a goal of relieving every Vermont home of dial-up connectivity by the end of this year. The state won’t quite hit the December 31, 2013, deadline, just as the Douglas administration wasn’t able to make good on a similar pledge of statewide coverage by 2010. However, that’s not for lack of trying to ease the way for faster expansion. Originally passed by the state legislature in 2007, 248(a) streamlined the process by which funds from federal, state and private sources could translate into real telecom infrastructure. The law “has proven itself to be a useful tool for encouraging companies to make their wireless investments here in Vermont, to expand service or upgrade their networks to faster speeds,” says Christopher Campbell, executive director of the Vermont Telecommunications Authority. As director of the VTA, Campbell has been on the front lines of the Shumlin administration’s telecom push. His agency helps marshal public funds to independent telecom companies that — after receiving certificates of public good — can lay fiber-optic cables and build wireless broadband towers in parts of the state not already covered by federal or private investment. Grants and loans from the U.S. Department of Agriculture to companies like VTel have been the greatest boon for Vermont’s broadband campaign, which is 99 percent complete. With gaps plugged by the pledge of state dollars, Campbell stresses that every Vermont neighborhood now has a broadband project in the pipeline. “That’s a pretty amazing statistic. The fact that we’re able to identify projects that are matched up with the remainder of those unserved addresses — I’m not aware of any [other] state that’s able to say that,” Campbell says. The 4G LTE investments of mobile providers such as AT&T aren’t taken into account in the state’s broadband metrics. But if they were, the outlook for Vermont connectivity might be even rosier. With broad wireless service, anyone with a smartphone and a data plan can now access the internet. In the last three years, AT&T has doubled the amount of data on its national mobile networks. In Vermont alone, it invested $50 million from 2009 to 2011, explains Will Keyser, AT&T’s New England spokesperson. Not everyone in Richmond is resisting AT&T’s efforts. On the Front Porch Forum, some residents have chimed in that the town should welcome telecom investment, which could boost the economy and tourism. Randy and Sue Mobbs, who live two roads over from Hall on Dugway Drive, both work at Fletcher Allen Health Care in Burlington. The hospital hosts several cellphone antennas, the couple points out, and they’re not worried about the public health issue. “Personally, I think it’s a great idea. The day of the land line is coming to an end,” says Randy Mobbs. Emergency responders also rely on cellphone coverage, he explains. And individuals leasing their land to telecoms will benefit from the deals. In a 2010 test of cellular service along major highways, the VTA reported that some of Chittenden County’s biggest dead zones were along the Richmond portion of I-89. The agency carried out another highway test in September and is still analyzing the findings. Town manager Geoffrey Urbanik says cell towers could help eliminate those dead zones, which include stretches of Hinesburg, Huntington and Jericho roads. But the administrator frets that letting private telecom companies compete for land without the town’s input isn’t the answer. “What we have yet to see is a plan that weighs these costs and benefits and presents an optimal strategy for providing wireless telecommunication services. We are concerned the proposed towers may provide redundant, uncompetitive service potentially leading to abandoned or underutilized towers,” Urbanik wrote in a letter to the PSB on behalf of the Richmond selectboard. He requested that the PSB consider all the towers proposed for Richmond at the same time and grant the selectboard intervention status in the hearings. According to Keyser, the AT&T spokesman, the company’s engineers have done the math to maximize the coverage area of their towers. Federal laws are in place to guarantee that no health issues stem from the proximity of the equipment, he explains, while the company makes every effort to mitigate the environmental and aesthetic impacts by reducing the height of the towers or disguising them as pine trees. But to provide effective coverage, Keyser acknowledges, those towers have to rise above obstacles that would interfere with cellular signals. In Green Mountain towns, that sometimes means towers on the horizon. The statute that allows telecom companies to go straight to the PSB has been renewed twice. But unless the legislature renews it again in its upcoming session, it’s set to expire next summer. “We get the sense that some of the cell companies might be nervous that they would have to go through a local process, and they want to get as many approvals as they can before that law expires,” says Urbanik, the Richmond town manager. When the state legislature last renewed 248(a) in 2011, lawmakers assigned it a July 2014 sunset to coincide with the end of funding from the U.S. Department of Agriculture to companies expanding broadband access to low-income, rural areas. VTel was Vermont’s largest beneficiary of that program, receiving $116 million in grant money. Although the Springfield-based company isn’t building the tower on Johnnie Brook Road, it plans to rent space from SBA Communications for one of its wireless broadband antennas and cosigned the application for a certificate of public good. VTel is paying for that antenna with private capital, not its federal funds. Lynne Hopkins, a spokesperson for SBA, wasn’t familiar with the Richmond deal and declined to comment for the story, but representatives from both VTel and AT&T dispute Urbanik’s suggestion. While acknowledging that 248(a) has made it easier to expand in Vermont, Keyser points out that AT&T has been carrying out similar projects across the country. Over the course of the 248(a) application process, there are two periods for affected parties to file their comments with the PSB: the initial 45-day notice and a 21-day period after the applicant has submitted a full proposal. As a quasi-judicial board, the Vermont PSB does not speak to the media. But Aaron Kisicki, an attorney for the state Public Service Department, predicts that the board will grant a hearing to the Richmond parties, given the number of requests for intervention status. It does so for only about 10 percent of the 248(a) applications, he adds. Jim Porter, director of the Public Service Department’s telecom division, also doesn’t see any validity to the claim that the telecom companies are racing to get in their applications. He predicts the town and telecom companies will reach some sort of middle ground.